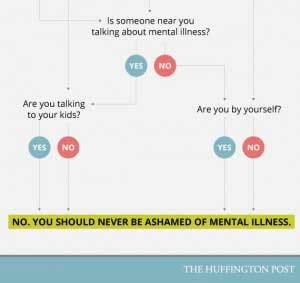 Mental Illness Shame: Should You Be Ashamed Of Your Mental Illness? This day in age, everyone is worried or not worried about being labeled and judged. They are either out and open about their choices and issues or keep all of their issues and opinions to themselves. Mental illness shame is no exception to the rule. While there are many people out and sharing their mental illness stories or supporting other people with mental illnesses, the sad reality is that many still hide in fear. What is this fear? There is a huge stigma involved with mental illness, like many other issues in life. This is where mental illness shame comes into play. Mental illness shame is more than just hiding a condition you have, it’s hiding from treatment, which can be very dangerous. Close to 31 percent of people suffering from a mental illness say they choose to not seek treatment for their disorder due to the fear of being judged. Mental illness shame is a huge issue that a lot of people deal with everyday. 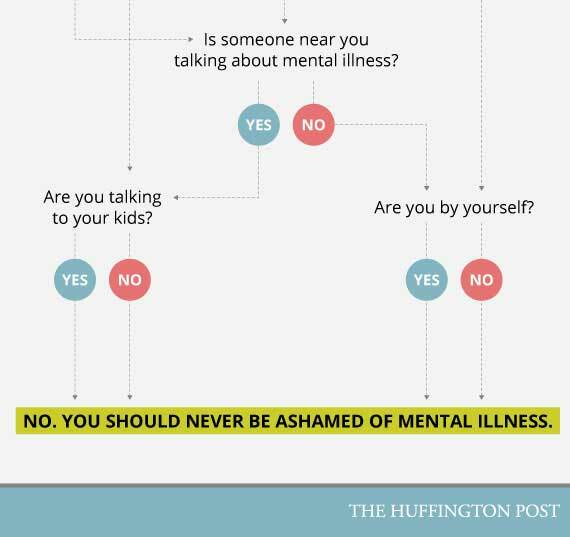 “The Huffington Post” put together a chart to help you to know when should you be “ashamed” of your mental illness. The graph asks different questions that lead to other questions like, Are you alone? Are you talking to your kids? All of these questions lead to the exact same answer: YOU SHOULD NEVER FEEL ASHAMED OF YOUR MENTAL ILLNESS. In a work environment mental illness shame can be a source of stress for individuals suffering from a mental illness and hiding it. Disclosure provides the opportunity to request reasonable adjustments at your job that will relieve the stress you might be under. Carlstrom states, “It is important to assert your needs based on what you feel is necessary for your productivity.” Carlstrom continues, “Many people don’t stand up for themselves in the workplace,” Carlstrom continues to explain, “but if they advocate for themselves they may be able to get accommodations to suit their needs, whether that be a more flexible work schedule or some other way to control the pace of their day.” If you’re not comfortable with telling a supervisor, try a manager or co-worker that you are comfortable with for support. Then after talking with them, you should start to feel more comfortable around others as well.